The TRE Training School opened in August 1941 in Forres School, Swanage. Prior to this there was no on-site training available for TRE’s own staff who literally had to ‘learn on the job’. Dr L G H Huxley was appointed as Principal (brother of Aldous). He prepared the training material; other teaching staff were drawn from within TRE. 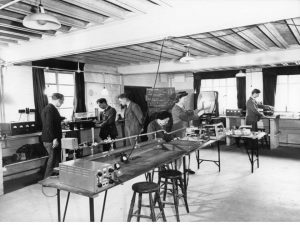 Mostly external students attended: Chain Home radar operators learnt to determine ‘how many aircraft’ were on their display; the Cm. wave techniques courses were attended by many senior officers from across the 3 services. Evening classes were laid on for TRE staff (subjects included: Fundamentals of radio, The principles of circuits used in RDF, Introduction to cm wave technique.) It seems unlikely these courses were optional. 430 students attended in the first 5 months. 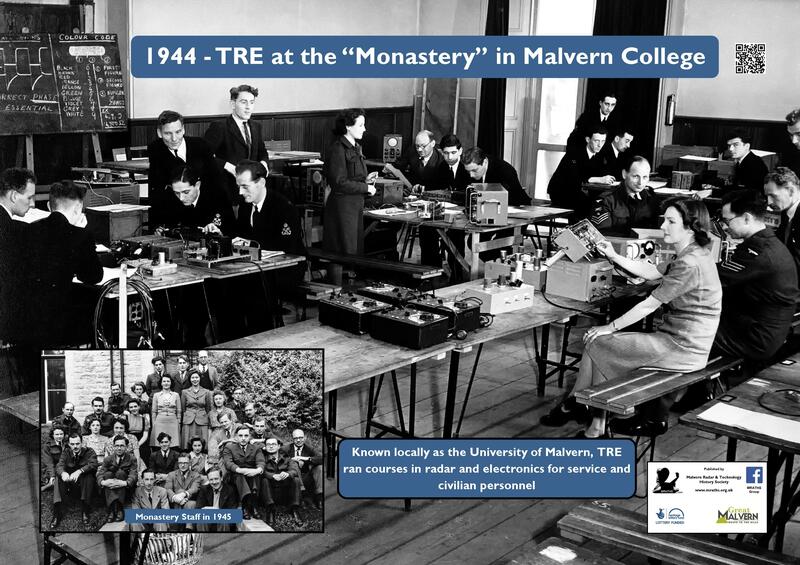 Following the Bruneval raid (Operation Biting) in February 1942 the order was given that TRE had to move – Malvern College was the selected destination. The move took place over the Easter weekend. A much enlarged training school was established in an old church next to the College – hence the name of ‘The Monastery’. 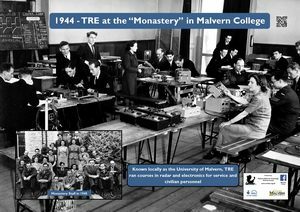 This allowed a degree of separation from the highly secret scientific work going on in TRE but also access to the latest developments in the labs so that the courses could be kept up to date. The Monastery naturally had access to the latest equipment. There were 22 staff meaning 100 students could be taught at a time. All new TRE scientific staff were given a 10 week training course before joining the labs proper. By March 1946 some 6000 students had attended courses including 2 Air Vice-Marshals and 6 Air Commodores. A wide range of personnel came from across the RAF, WAAF, Civilian, Navy, US Army and British Army. TRE staff also conducted training at other sites – particularly maintenance units. 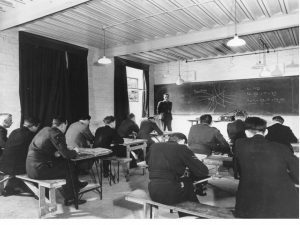 At the end of the war there was still a demand for training but the TRE school staff had mostly returned to their previous occupations or had been made redundant. Leonard Huxley went to Melbourne University.